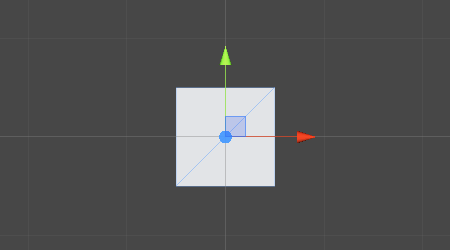 In today's Tutorial we will learn how to make a 2D Space Shooter Game in Unity with less than 100 Lines of Code. As usual everything will be explained as easy as possible so everyone can understand it. 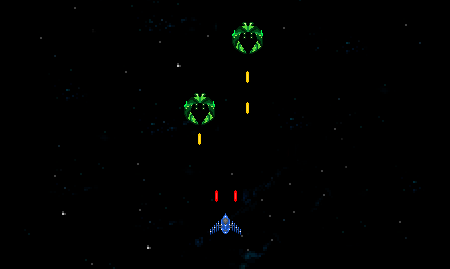 Our 2D Space Shooter will be inspired by the old arcade games that everyone loved when growing up. We will make use of all kinds of different Unity features like Physics (including Rigidbodies and Colliders), Animations (Mecanim), Scripting (C#), Prefabs, Shaders and the Sprite Editor. The game art will be very easy to create with our drawing tool of choice. We will explain every single step in detail, but it's still a good idea to get a basic overview of Unity if you never used it before. Feel free to read through our easier Unity Tutorials like Unity 2D Pong Game to see what Unity is all about. 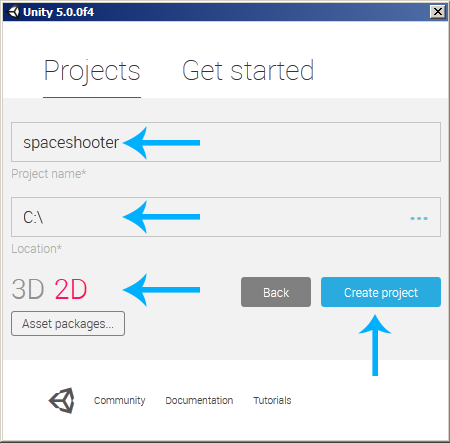 If you used Unity before then we can get started right away. Our Space Shooter will use Unity 5.0.1f1. Newer versions should work fine as well, older versions may or may not work. The free version of Unity 5 now comes with all the engine features, which makes it the recommended version. Note: right click on the image, select Save As..., navigate to the project's Assets folder and save it in a new Sprites folder. Note: usually we would set the Texture Type to Sprite for a 2D game. But scrolling a texture with UV Mapping only works for Textures, not for Sprites. Sprites would be pixel perfect, but scrolling them requires a Shader that would be far too complicated for this tutorial. 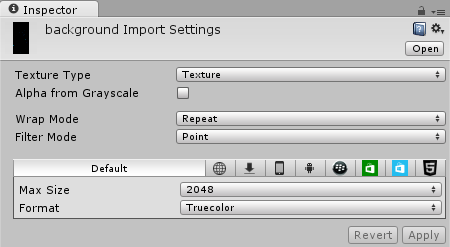 Note: we use a Quad from the 3D Object menu in a 2D game because a Texture (instead of a Sprite) can be added to it. Feel free to play around with those properties and see how they change the background. 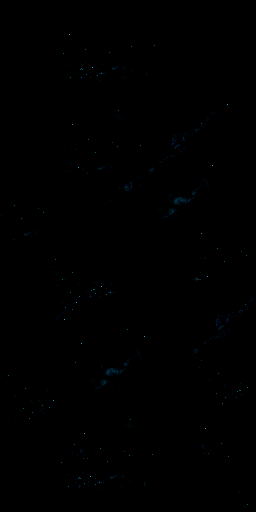 Tiling will repeat it and Offset will change the texture's position. 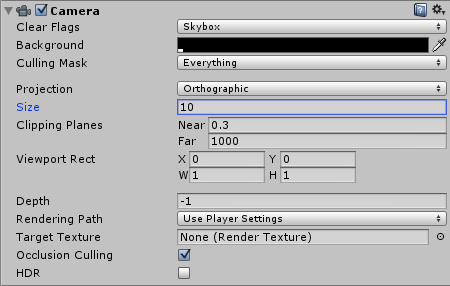 If we set the y Offset to values like 0.1, 0.2, 0.3 and so on then we can already see the scrolling happen. Note: while it looks really simple, there are quite a few things happening behind the Scenes here. First of all, we used a Vector2 for our speed variable to make sure that we can modify the x (horizontal) and y (vertical) speed. 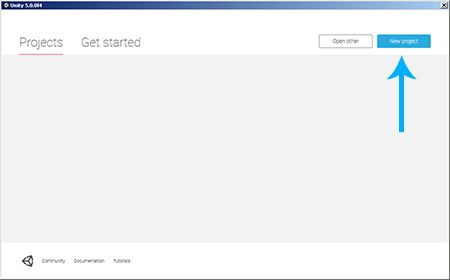 We use GetComponent<Renderer>() to access the renderer component. Using GetComponent<Renderer>().material makes sure that the UV offset is not modified permanently, as it would be the case when modifying it by hand. 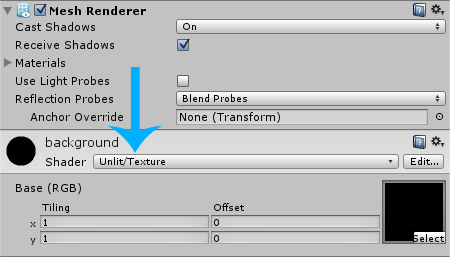 Instead by using GetComponent<Renderer>().material Unity creates a runtime copy of the Material and deletes it after the game is stopped. Furthermore we use the mainTextureOffset property to modify the main texture's UV offset. We then use Time.time to achieve the Scrolling effect because Time.time is the elapsed time since the beginning of the game. 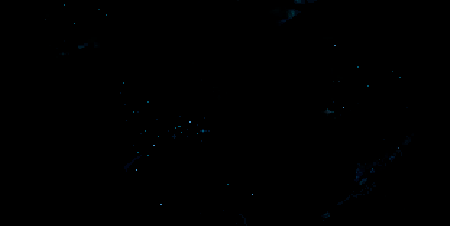 And since this time always increases smoothly, we might as well use it for our Scrolling. Furthermore we multiply the time by our speed to slow it down or make it faster. And because our speed variable is a Vector2, it will still be one after multiplying it with Time.time. So in the end we get a new Vector2 that will be used for the UV Offset. This effect is pretty good, but we will go one step further and implement Parallax Scrolling to add even more depth to it. Enjoyed this preview? 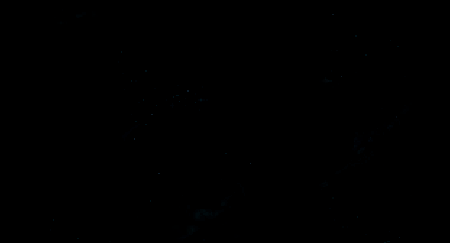 Become a Premium member and access the full Unity 2D Space Shooter Game Tutorial!